Western grid operators have been making plans for large-scale renewable energy imports into the California electricity market, prompting the governor’s Senior Advisor for Renewable Energy Facilities to write a “self-reliance” response. 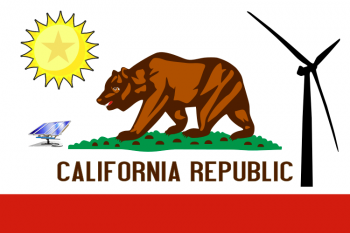 In summary, California has a robust in-state market for renewable energy and sufficient in-state renewable resources to serve its entire electricity needs, so Western states would do well to temper their export optimism. Update 8/23/11: While solar can be built right under high voltage transmission lines, it can’t necessarily interconnect right at the tower. 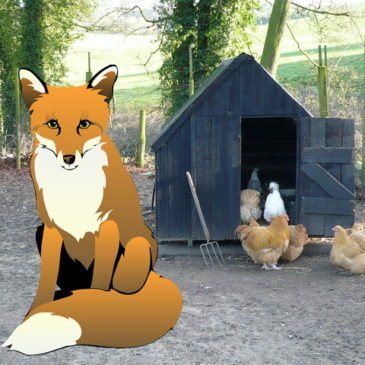 Thus, this piece should be read as an analysis of land use rather than easy interconnection. What if the U.S. could get 20 percent of its power from solar, near transmission lines, and without covering virgin desert? It can. Transmission right-of-way corridors, vast swaths of vegetation-free landscape to protect high-voltage power lines, could provide enough space for over 600,000 megawatts of solar PV. These arrays could provide enough electricity to meet 20% of the country’s electric needs. It starts with the federal Government Accountability Office, which estimates there are 155,000 miles of high-voltage transmission lines in the United States (defined as lines 230 kilovolts and higher). 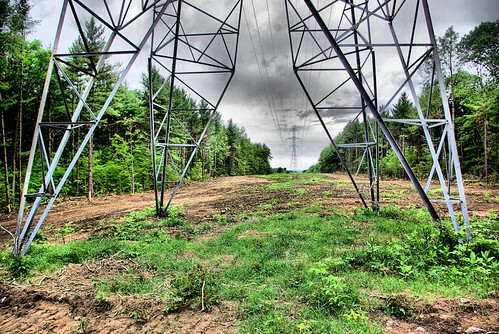 According to at least two major utilities (Duke Energy and the Tennessee Valley Authority), such power lines require a minimum of 150 feet of right-of-way, land generally cleared of all significant vegetation that might come in contact with the power lines. That’s 4,400 square miles of already developed (or denuded) land for solar power, right under existing grid infrastructure. Of course, the power lines themselves cause some shading, as may nearby trees (although the New York Public Service Commission, and likely other PSCs, has height limits on nearby trees that would minimize shading on the actual right-of-way). 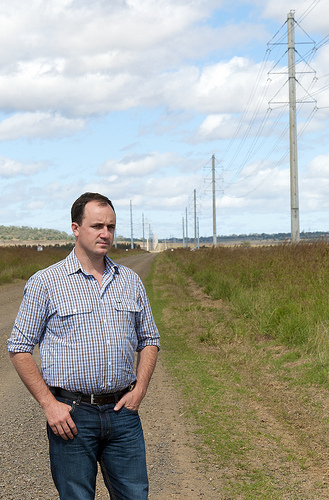 To be conservative, we’ll assume that half of transmission line right-of-way is unsuitable for solar. That leaves 2,200 square miles of available land for solar. With approximately 275 megawatts (MW) able to be installed per square mile, over 600,000 MW of solar could occupy the available right-of-way, providing enough electricity (over 720 billion kilowatt-hours) to supply 20 percent of U.S. power demands (note: we used the average annual solar insolation in Cincinnati as a proxy for the U.S. as a whole). Making big strides toward a renewable energy future doesn’t require massive, remote solar projects, but can use existing infrastructure or land to generate significant portions of our electricity demand. Transmission right-of-way, providing 20% of U.S. electricity from solar, is just one piece of the puzzle, with another 20% possible using existing rooftops and a solar potential of nearly 100% from solar on highway right-of-way. Solar can help achieve a 100% clean – and local – energy future. Update 7/26: One commenter asserts that the loss figures offered by the original author may be relevant in India, but do not reflect the U.S. grid, where losses total around 7%. EIA data seems to reflect this [xls]. The biggest problem with the multi-MW solar PV plant is that it loses 12-15 percent of expensive power as it passes through a series of power transformers. 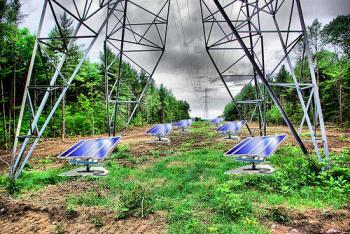 PV solar inverters generate power at 400 [Volts] three-phase. In large plants, this power is first boosted to 66 [kilovolts] or more with several power transformers and then stepped down to 400V with another string of transformers to suit consumer requirements. In addition, there is a further transmission loss of 5-7 percent in the power grid. Why suffer an avoidable 20 percent loss of expensive solar power? …There is thus no ‘scale advantage’ in large PV solar plants. In reality, all multi-MW plants are basically clusters of several 500-kW plants since solar inverter capacities are limited to about 500 kW and no more. Why not have one hundred 500 kW plants instead of one giant 50 MW plant? 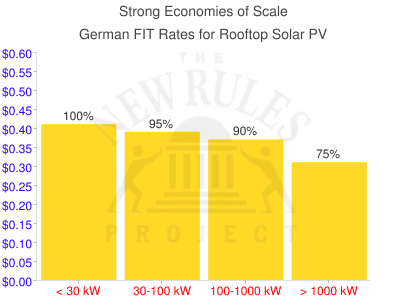 The next chart shows the economies of scale in the German rooftop PV market, as reflected in their feed-in tariff rates. The percentages show the price in each size tranche relative to the price for the smallest rooftop PV systems. Once again, there are significant savings for scale, especially when going from a project 100-1000 kW to one that is 1 megawatt or larger (15 percent). But if there is a 20% power loss for the voltage stepping and transmission for larger solar projects, then when it comes to delivered power, small projects may perform better. Let’s assume that projects 1 MW and larger require the voltage step and transmission (and incur the losses), whereas smaller plants do not. The following two charts illustrate the difference. 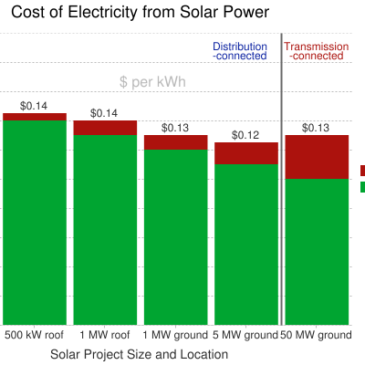 The first chart takes the Clean Coalition (green line) data from the Solar PV Economies of Scale chart and calculates the levelized cost of the power from each size power plant based on the sunshine in southern California. 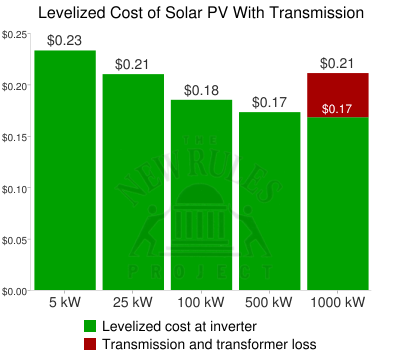 For the largest size solar power plants, the cost is adjusted for the losses due to transmission and transformer stepping. As we can see in the first chart, the losses from transmission wipe out most economies of scale for large-scale solar, making 1 MW and larger solar PV plants equivalent to on-site solar power from a 25 kW solar PV array. We can similarly examine the effect in the German case. Here the government sets the price paid for solar by size class, and since it’s based on output at the power plant, large-scale plants that have transmission losses get paid for their entire power output, regardless of how much usable power reaches customers. The following chart shows what German customers effectively pay for solar, assuming that 1 MW and larger facilities all experience the 20% transmission losses explained earlier. 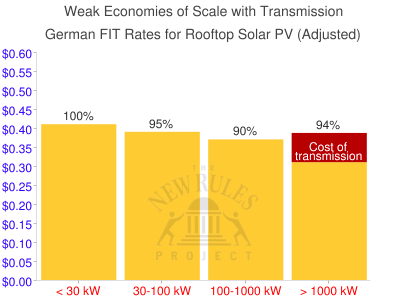 As we can see in the chart, the cost of transmission can wipe out the economies of scale in installed costs, making large-scale solar comparable to solar PV of 30-100 kW, but without the same transformer and transmission losses. 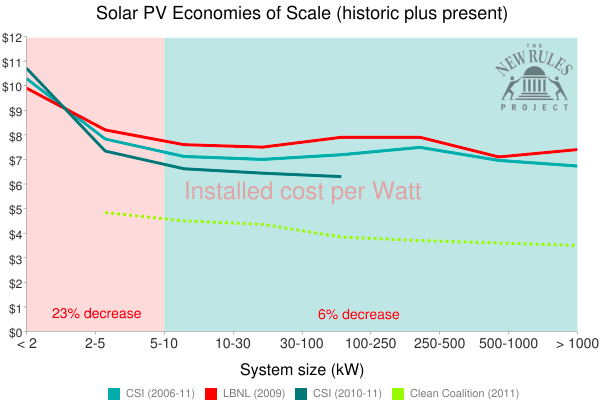 It may be true that the installed costs of solar PV continue to fall as projects get larger, but it’s clear that relying on the price of solar at the power plant does not accurately reflect the cost to the grid or ratepayers. For some size of larger power plants (1 MW? 5 MW? ), the lost power from stepping up and down voltage through transformers and from transmission may largely offset the economies of scale from building a larger power plant. Rather, mid-sized solar (or specifically, projects that can connect directly into the distribution system without changing the voltage) may deliver the best cost per kilowatt-hour.